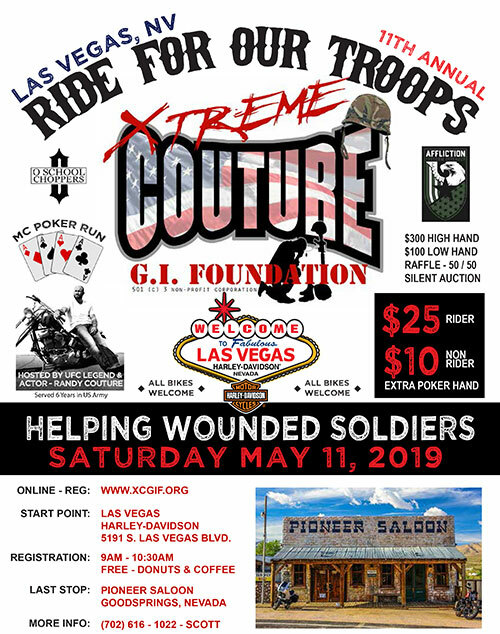 Join Randy Couture as he hosts the 11th Annual MC Ride For the Troops Charity Poker Run on Saturday, May 11, 2019. Ride and meet other motorcycle enthusiasts for a great cause while ending up at the famous Pioneer Saloon in Goodsprings, NV. We have prizes for the best and worst hand, 50/50 raffle and always some great silent auction items. For information about sponsoring this popular event, please contact Scott Haney (702) 616-1022 / scott@xtremecouturemma.com. 2019 sponsorship opportunities are available to view here. Reserve your Spot today - Buy your tickets here. Please Join Randy Couture Monday, August 12, 2019 for a charity varity show - VEGAS STYLE..
Mark Shunock gathers an eclectic cast of guests including stars from Hollywood, the Strip, musical acts, athletes, and celebrity chefs for 90 minutes of chat, entertainment – and a lot of laughs. Since 2013, Mondays Dark has partnered with over 30 local charities, this year the GI Foundation was selected. It’s mission is to raise 10k in 90 minutes. The $20 variety show has become one of the hottest tickets in town. Reserve your Spot today - Don't wait it will sell out, get your tickets here. Please join Randy Couture at our Sporting Clays Tournament, Saturday, October 12th, 2019 at Clark County Shooting Complex. 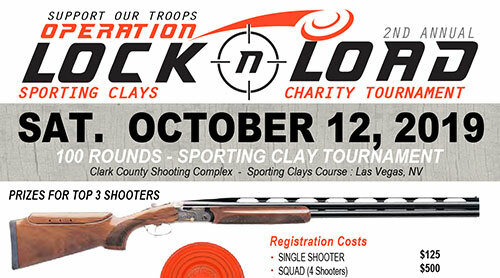 Enjoy a day of team clay shooting followed by a BBQ lunch. We encourage you to form a team of four shooters, but we would be glad to create a team with other solo shooters should you wish. Cost of registration includes a 100 shot sporting clay tournament, ammunition, golf cart, breakfast, and a lunch plus drinks. A limited number of shotgun rentals are available, and can be reserved in advance. Xtreme Couture GI Foundation teams up with Tuff-N-Uff for its tenth annual charity event at Sam’s Town Hotel and Gambling Hall on Saturday, November 9th, 2019. Now in its tenth year, “Round 10: Operation Knockout” is an MMA and Grappling event that was created to help raise funds and awareness for wounded soldiers and their families. Following nine successful years, this year’s event looks to be bigger and better.